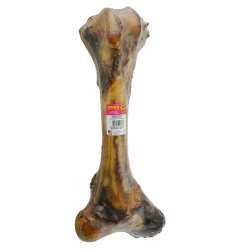 Your dog is in for a huge treat when it gets its paws on this Jumbo Bone. It is a whole USA-sourced natural beef femur bone from the hind leg; this means that you get two knuckles on each end, along with the center bone. What a deal, 3 in 1! Measures 16-18” long, with no artificial ingredients. The Jumbo Bones have meaty pieces on the whole bone and are dipped in liquid smoke.